People cherish their pets. Some even go so far as to treat them like small, fuzzy children within their own homes. Of course, we all want the best for our four-legged friends who stand by our side, which is why it makes so much sense to consider artificial turf in the backyard for your feline or canine pal. When considering such an option, however, homeowners should understand the pros and cons involved with such an installation and what it involves. To start, artificial turf has an incredibly low maintenance cost. You do not need to water, fertilize, or use pesticides on the turf. The lack of pesticides especially makes it a wonderful option for pets. You receive the benefits of a beautiful, green lawn, but without the cost or effort. Second, artificial turf is quite durable. We all know that dogs love to dig and cats love to shred. Artificial turf is not exactly like grass, so you won’t notice holes or mess. No more muddy patches or uneven areas from your pet playfully destroying the yard. As for cons, there are two major factors to consider: heat and cost. For heat, the artificial grass is generally made of polyethylene fibers, which tend to get quite hot when exposed to sunlight directly. This can be uncomfortable for those walking barefoot and for your pets. A bit of carefully placed shade should do wonders, though. 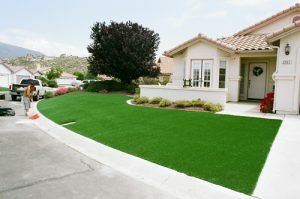 In terms of cost, synthetic grass is going to be a big investment for a homeowner. It can be somewhat expensive when you first make the purchase, though it can be a wise investment when compared to natural grass. You have to consider the long-term. If you feel your Fort Worth home could benefit from artificial turf for your pet, call Blooms Landcare today at (817) 688-5352.